Good clear high quality optics.. I don't care for the blue view you get when looking through them. Wish it was a clear view like my nikons but other than that they are high quality nice for the range. And will clear up once adjusted at the large power. I have owned other binoculars before but they were smaller and lighter. I bought this model though a little on the heavy side but not too bad, they are magnificent. 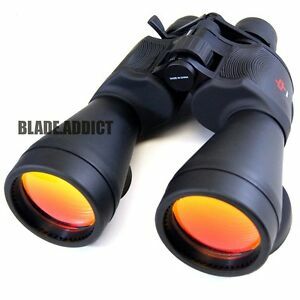 I wanted these for star watching, moon gazing, and bird watching. I hand made my own little jig so I can tripod mount them with the screw adapter already on the binoculars. It takes all the jitter's out of viewing at night or day and it works out quite well for me. They magnify the moon enough to see what I need to but not as good as a dedicated telescope which would cost much more. For me they are great especially since this model has a zoom effect which helps a lot too. I love them and a carry case was included too. I recommend this model depending on your specific interests. They are definitely not for everyone however. Thanks! Quick delivery. Looks to be solidly constructed. I don't intend to go dropping it to find out if it'll break. The lenses are polarized glass of good quality. Comes with lens covers which is a plus. I use it at the range and I can clearly see the targets out to the 200yd range limit. Can't wait to find out how far I can set the target(s) before the image blurs. Highly recommend this purchase. Weighs a bit more than I expected and took awhile to get use to how to sight in, but when I want to see something close up, I'll pull these out every time. Very well built.